These, at least, are the hopes of essayists in Through the Eyes of Tiger Cubs: Views of Asia's Next Generation. The book uses essays from the Asia's Challenge 2020 contest sponsored by TIME, the Asia Business Council and the Lee Kuan Yew School of Public Policy at the National University of Singapore. In the contest, Asians born since 1978 were asked to single out the biggest problem facing Asia over the next decade. Expectations are high from this rising generation. Singapore's Poh Wei Long warns that "attitudes toward work and life may be antithetical" to their parents', and they "are not keeping mum about it, at least in the blogosphere." In short, Asian living standards are rising, but expectations are shooting up even faster. We call them "tiger cubs," these nearly 1.5 billion young Asians on the prowl for new opportunities. Their performance on standardized math and science tests is world-class. Yet they complain their education isn't preparing them for the knowledge-intensive jobs of tomorrow. They want both better access to education and higher-quality education. They expect governments and corporations to do more to solve poverty, inequality, and energy and environmental problems. Whether it's the latest iPad or delivery of basics like elementary-school education, they know what the global standard is and they don't want to hear excuses as to why it's not possible in their country. 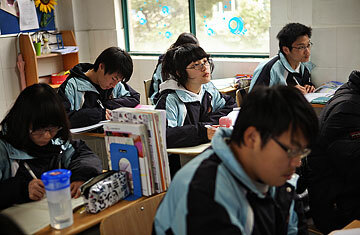 Look at the tiger cubs' attitudes toward education, a key building block for Asia's economic success. India's Ashwin Menon, in a comment that echoes many complaints about Asia's schools, frets that "the current system in most nations involves rote recitation and does not, in any way, encourage creative thinking." Governments and companies are often too proud of their successes to notice the revolution in expectations. Hong Kong's establishment has been blindsided by a series of demonstrations against everything from a new high-speed train line to the demolition of the old Star Ferry terminal. Few would have imagined that Indonesians would be among the world's largest Facebook users or that aggrieved citizens there would use social media to fight corporate misbehavior. In Singapore and Malaysia, bloggers and netizens have made politics-as-usual unthinkable  as seen in last year's Singapore elections, in which the ruling party's share slumped, and in websites like malaysiakini.com, which rallies opposition forces in Malaysia. Even China's Great Firewall couldn't stop supporters of Ai Weiwei from donating money to help the activist-artist. The technology is important. But ultimately it's not the medium, it's the message. And the message is that with the basics of national sovereignty and economic essentials stronger than ever, the soft elements, institutions and values need more attention. "Without good governance, all policies, plans, or solutions are redundant," writes India's Rohit Pathak. "The biggest hurdle in the way of good governance is corruption, as it is, undoubtedly, the direct and indirect cause of almost the entire spectrum of our problems such as poverty, terrorism, illiteracy, poor infrastructure, and others." Previous generations grew up in a continent defined by poverty and struggle, often made worse by war and revolution. The tiger cubs' grandparents struggled for survival during a global depression and World War II, then watched as Asian nations painfully broke free of colonialism. The tiger cubs' parents kept their heads down and were happy to have jobs as parts of Asia started growing at rates the world had never before seen. Japan boomed first, followed by the four Asian tigers of Hong Kong, Singapore, South Korea and Taiwan. Then China, India, and Indonesia joined in. The result: a historically unprecedented number of people pulling themselves out of poverty. Young Asians today have grown up at a time of Asia Rising. In every dimension, it matches the American social revolution of the 1960s, so gorgeously portrayed in the TV drama Mad Men. Like that great transformation, Asia Rising marks an end to deprivation, armed conflicts and violent ideological clashes, and the beginning of seemingly infinite choice and possibility. Today's young Asians can tap, via the Internet, into a global forum that was unimaginable when they were born. They can go to school in much greater numbers and, once there, study for more years than their parents did. They can aspire to jobs in fields like biotech, IT and financial derivatives that literally did not exist a generation ago. Above all, they know that they are living in the world's most dynamic continent. Their elders celebrate success, but the tiger cubs are impatient with continuing failures. "While the whole world has been fixated over the promising economic indicators and the growth potential of the region, the curse of weak political systems has been consistently ignored," writes Pakistan's Omar Randhawa. Their elders have given them many names, mostly pejorative: Japan calls them the "herbivore generation" in contrast to the workaholic salarymen who preceded them, and those still living at home are parasito shinguru ("parasite singles"). Taiwan dubs them the "strawberry generation," because they bruise easily. In China they are the "little emperors," and in India they are "in a hurry." This condescension is misplaced. Sure, expectations are high. The tiger cubs want good jobs, not just any job. They expect companies and governments to be accountable. Whether it's treating a customer badly or gross abuse of state power, the always-on generation will make its voice heard  on Facebook, Twitter, YouTube or on the streets. Sure, Asia won't be the same. It will be even better thanks to the tiger cubs' demands for transparency. Clifford is executive director of the Hong Kongbased Asia Business Council and co-author of Through the Eyes of Tiger Cubs: Views of Asia's Next Generation.